Mary's Thrifty Chic // 1 Pattern Many Looks-Pt 3 of ? 1 Pattern Many Looks-Pt 3 of ? Meet 1 pattern many looks part 3. Yes, it is the same pattern, just tweaked a tiny bit! This is my finished version and below you can sees the "Anthropologie" picture that inspired me to use my premade pattern. My interpretation used a too tight t-shirt (brand new) purchased at Goodwill for a mere $2.50. You can see the original has a doleman sleeve, (don't worry I have that covered with a later look) but I think I hit the feeling of this one just the same. 1) First, I cut the too tight t-shirt just below the armholes leaving a 1" hem. Then I trace basted the stitching line of the bodice so I would not have to use drawing pencils. I find this method to be a little more accurate for me. 2) Next, I used the front and back of my existing pattern and folded down the desired amount to replicate the look of the original. As I folded, I pinned along my trace basted line. 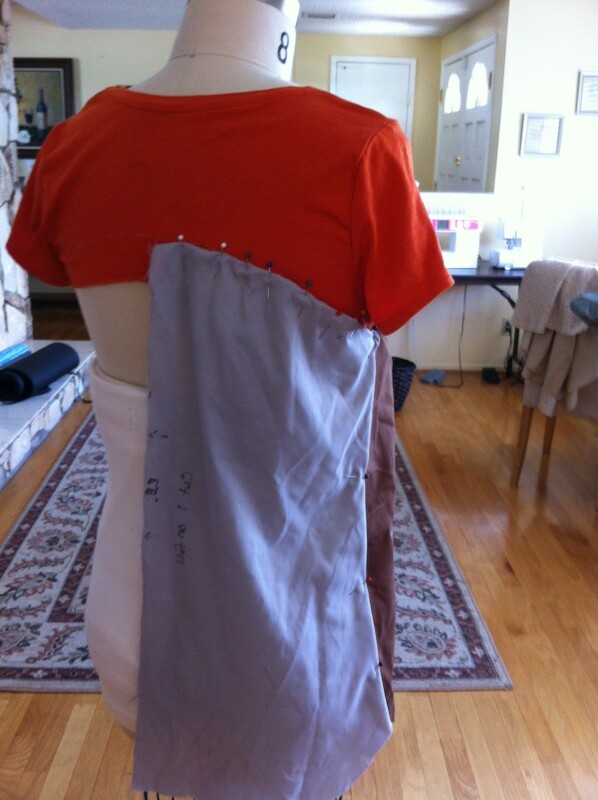 3) Cut out the front and back panels making sure to leave a 5/8" hem across the top. Sew the side seams first. 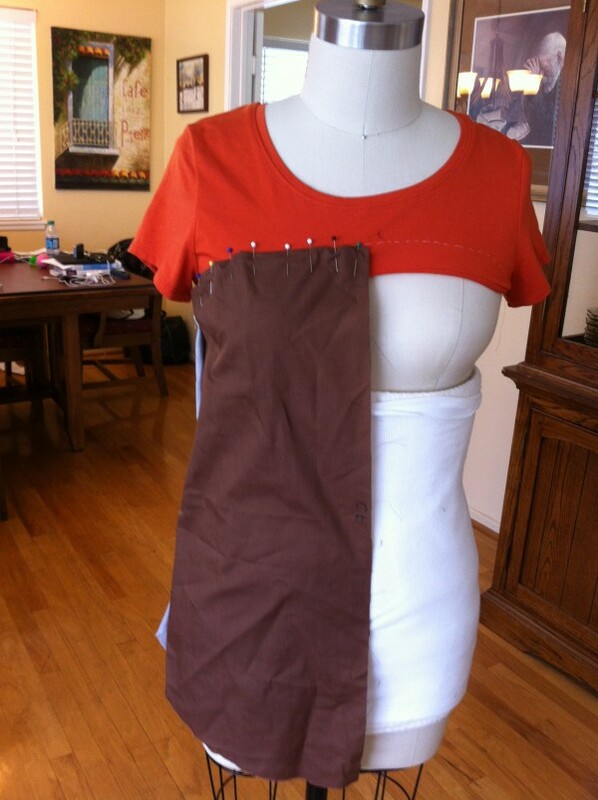 Then pin and sew the bodice. 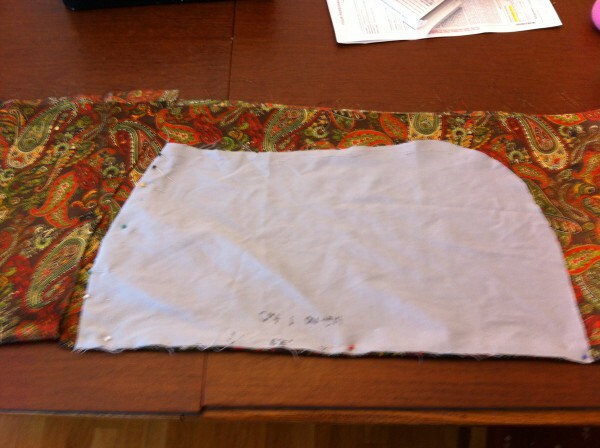 Finally, you are ready to 1/4" hem the bottom. Here I am again with it all put together. This was a vast improvement from that vacuum sealed t-shirt that I started with. I saved the parts of the t-shirt that fit, and said good-bye to the rest. All in all, much more comfy. What do you think? This would be an easy project for a beginner. Give it a try! Love the new hi/low shirt! Perfect colors and pattern for fall. Thank you Jennie! The high/low shirts are so comfy! Awww! Thanks Jessica! I love to hear that stuff. Have a wonderful day!!! This is a really good way to use a T-shirt that is otherwise unsuitable. I’m thinking of a couple of mine that are either stained below the bodice (I attract tomato sauce like a magnet) or have holes starting (my cats think I’m a tree) or are too short. I love your paisley material! Thanks for your comments! Yes, it is a great way to use old or too tight t’s. This pattern will be a staple for me. Now my t-shirts can be less tight, boring, and you will continue to see how they can all look different! 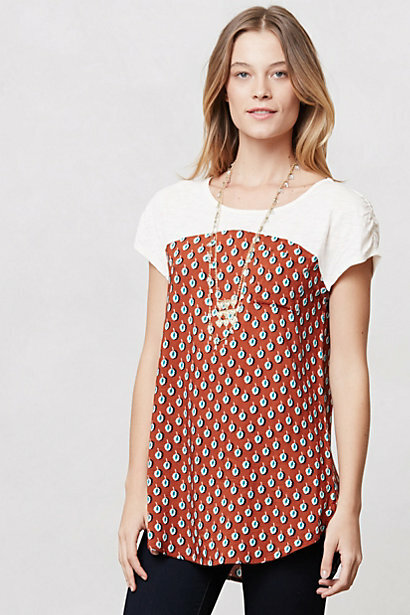 The print fabric is a woven. I stretched the t-shirt to fit the woven as I was sewing it down. Yes, the bottom of the t-shirt could be used to make a baby cap. Great idea! Just came upon your post on Pinterest. I love your idea & pattern. Beautiful! Thank you Sarah! Welcome to my little blog! Love this! how did you figure out the bottom part of the t-shirt? Did you stretch it while on the dressform? How do you draft the bottom part? This is a really great fix. Thanks again! Thank you for the comments! Please scroll down and read the tutorial. I explain the drafting process there. If you have anymore questions after that, please let me know! 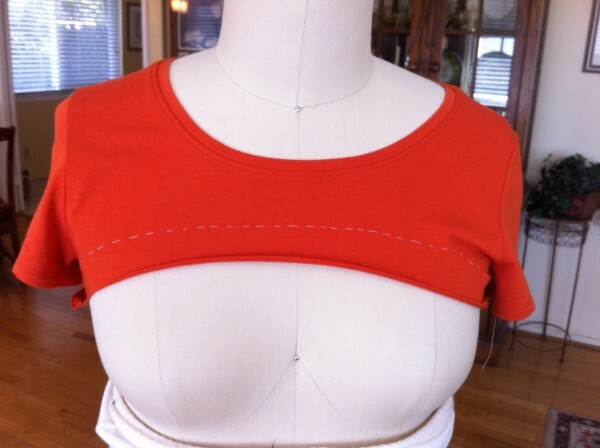 I would make the bottom from a matching tee shirt that fits the bust but is too big in the shoulders and arms, stretching the smaller top part seam to fit the larger bottom part seam, then put darts at the waist if you want a tighter fit there. Thank you Barbara! What a great idea.